She and Hincks – ‘no one calls him Mark,’ she says – knew the type of house they wanted when they started their search in 2013. ‘Something old, because I’ve never lived in a new house, and something we could do some work on,’ she adds. The location was less important than the type of property, so they searched in Wiltshire, Dorset and Somerset. ‘My mother had moved here nine years ago, so we knew the area,’ says Hana. When Hana and Hincks found the property, originally two weavers’ cottages that had been long since knocked into one, they knew their househunting was over. At the front was a pair of large, square reception rooms, leading to a kitchen at the back and replicated upstairs with two front-facing bedrooms and a bathroom off the landing to the rear. Subscribe to Period Living magazine to enjoy beautiful period homes and gardens every month. Indeed, the couple were so taken with the property that they were prepared to overlook its many quirks, preferring to work with them rather than against them. They decided not to extend or make dramatic alterations. ‘I liked the layout and it would have been more hassle to change things because of the listing,’ says Hana. So they had the property rewired, put in a damp-proof course and fitted a new kitchen and bathroom. The front door opens straight into the dining room, where Hana has used William Morris’ Willow wallpaper to disguise the wonky walls. Their first purchase was a baby blue electric Aga. ‘I’ve always liked that colour because it goes with anything, and I knew I could get a Smeg fridge to match,’ says Hana. However, when it came to the rest of the kitchen they encountered one of their home’s major eccentricities. A local carpenter built the kitchen to Hana’s design. The colours in the vintage fireplace tiles, used as a splashback, complement the slate flooring. Hana’s upholstery business and love of all things vintage can be traced back to her childhood. 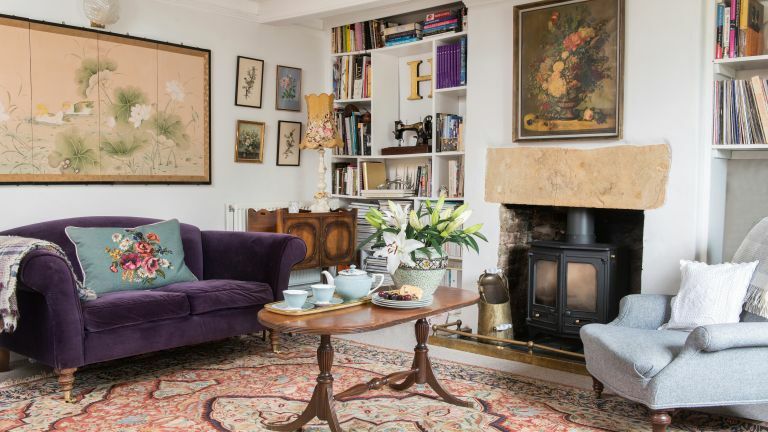 ‘We always had old sofas, which would go and then come back reupholstered a different colour, and I continued that in my career and here,’ she says. This trio of panels started life as a screen before Hana decided they would look better in individual frames and hung on the walls in her living room. Woodburning stove: Charnwood’s Country 6 is a similar option. He must have done, because curtains and cushions burst with the soft, elegant colours of aged Sanderson and GP & J Baker fabrics against a mainly neutral background, although Hana’s favourite colour, yellow, can be seen in flashes, in the dining room and Hector’s bedroom. The walls played tricks again when it came to the finishing touches. ‘We found our bedroom still had its old horsehair plaster, so putting up pictures was a nightmare – you can’t hammer in a nail in some places, so the house kind of picks where the picture will go, not you,’ she says. Hanging curtains became difficult, too, which is why, in some rooms, the rails are suspended from the supporting beams and not a wall-mounted bar. Arranging the WC and sink under the highest part of the ceiling allows Hana and Hincks to use the lower side for storage. For a similar cast-iron bath, try Drummonds. The mirror was a gift from Hana’s mother – Dunelm’s white Ormolu design is similar. The chair is by Hana & George. Hana decided the bathroom was large enough for her to decorate it ‘like a proper room’ with wood panelling and a chair to sit on so she or Hincks can keep an eye on Hector in the bath. They fitted a shower in an old cupboard space under the eaves and created a splashback from vintage-style tiles.